Physics. Those pesky laws of the universe constrain... or unleash... the amount of energy produced by an energy source. Here's a quick example of energy contained in a unit of fuel. By burning one kilogram (2.2 lbs) of their respective fuels, coal can power a 100-watt light bulb for about four days, natural gas for about six days, and uranium in a light water reactor can power the light bulb for just over 140 years. These comparisons have been seen before (and illustrated brilliantly by xkcd, right). We have also discussed how the land use by different energy sources here. But there are few comparisons out there for energy density of wind or solar. How do these compare, energy density-wise? In solar, the conversion is from photons to electrons. Most solar cells have between 10-20% efficiency in converting solar energy into electrical energy. The standard for an optimum of the sun's energy hitting a solar panel is about 1kW/m2, so with efficiency, the maximum of electrical energy produced by a solar panel is around 150 W per square meter of solar panels. However, the limiter is more by when the sun is shining and the amount of cloud cover- this is taken into account by capacity factor. When you consider a really good solar capacity factor of around 30%, then that electrical energy production number becomes closer to 50 W per square meter. We will call that one 50W lightbulb per square meter of solar panels (more realistically, it would range between zero and 150 W/m2, the average being 50, so we will call that one 50W lightbulb instead of sometimes-zero-bulbs-sometimes-three). So, one square meter of solar cells approximately powers one 50W lightbulb for about 30 years. How many 50W lightbulbs can be powered by a similar mass of uranium fuel in fission? If it is a 300 micron thick solar cell, that means 0.0003 m3 volume. Multiply that by uranium oxide density and you get about 4 kg of uranium. As stated above, that amount of uranium fuel could power TWO 50W bulbs for 560 years. In wind, rotational energy is converted into electrical energy using large magnets made of rare earth metals. This is obviously most constrained by when it is windy. How much energy is in a molecule of wind? About 0.044 eV. How much from a molecule in fission? 200,000,000 eV. Granted, there are a lot of molecules of wind, but they are also not always blowing, and only a factor of their energy when it is blowing can be captured into electrical energy. Since wind is not steady like sunshine, since it is so distributed, and since electrical production is dependent on turbine design this cannot be easily converted to Watts per unit volume. A calculation for another day, but the energy per molecule sheds light on the huge energy density discrepancy. No matter the type of energy, in the history of human experience we have never found an energy source near so efficient, so powerful, and so dense as nuclear. What difference does that make? Less transport, less emissions, less land use, less water use, less waste and so much more. And this isn't even touching the possibility for breeder reactors which produce energy while producing more fuel, or fusion reactors, which makes even fission look like a blip. Nicely done Caroline - an easily understood qualitative and quantitative summary of energy density in a nutshell. If there is one trump card that nuclear holds, it is this. What do you mean "if", Sir Rabbit? I did a rough calculation comparing nuclear to wind and solar for one of my outreach presentations and figured out that you need approximately 1000 windmills or 5000 km2 of solar cells (the size of the state of Delaware) to equal the electricity output of one 1000 MW nuclear power plant. Hi Lenka, may I ask you for the illustration you made? Did you post it somewhere? Many thanks. One more to add, every day the world uses 215 MMbbloe this is as much as 2,000 L of yellow cake. 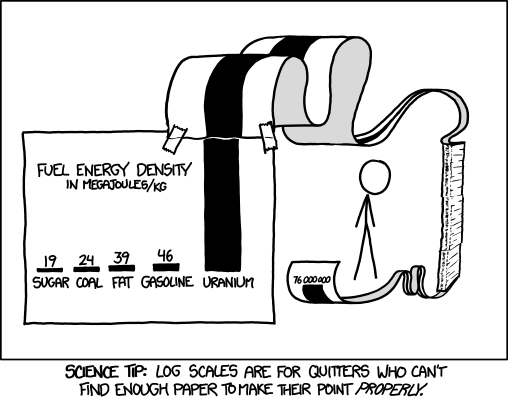 It's very interesting to see how this XKCD meme is propagating through the nuclear blogosphere! Rod Adams got it via a reader tip a few weeks ago. Agreed! I got it the day it was published from a friend as well... just waiting for the perfect use for it! Randall Munroe's got some good stuff... and fellow Massachusan! The figure I like is the one on my (old, now) IFR post: the uranium in the USA's enrichment tailings is enough to run the entire USA for several hundred years without mining another gram. The advantage to wind and solar though are they have no waste. More research needs to be done into variable material state fueled nuclear reactors that would potentially burn nuclear waste created until it was a usable plasma. Second stage on-site reactors could balance wastes by burning them in different reactor types that take advantage of these unique isotope properties. Just a few ideas.